Summer is here, and the time is right for dancing in the streets an epic road trip. Frequent readers of this blog may have noticed that things have been a tad quiet around here over the past month. Some of you may have even wondered why. The reason is that my wife and I have been on an epic road trip across Canada (and parts of the States) that left me way to busy to be able to share my adventures. Now that we are back, I can start to share some of our stories. So, over the next bunch of posts I will fill you all in on our epic adventures, but let me give you a summary. 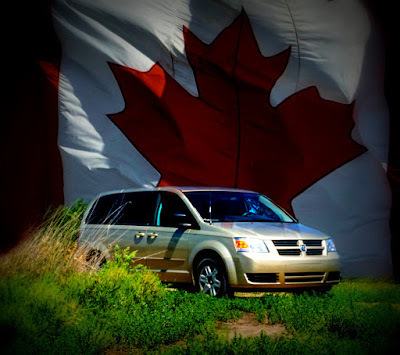 On July 18th we all piled into the Geovan of Destiny and headed northward from our home in North Carolina to our family in southern Ontario. There we left the kids in the capable hands of their grandparents. While the kids got a classic "summer on the farm with grandma and grandpa", my wife and I hopped back into the Geovan of Destiny and started an epic road trip across the middle parts of the country - from the eastern edge of Ontario to the western edge of Alberta (and beyond). An epic quest that took us over 18 days to get there and back again - tho we did stop to smell the flowers (and buffalo) along the way. Along the way we picked up friends and strangers, camped, geocached, photographed, hiked, adventured, and explored our way across the great and wonderful country known as Canada. So stay tuned as I'll share some of these adventures over the next few weeks. She's gonna be a beauty, eh?